Healthy Subzi with Sprouts and Beans. Beans and sprouts are one of the richest source of protein in a vegetarian diet. These should be a welcome addition to our diet daily. They are abound in iron, fibre, potassium, zinc, antioxidants and help get glow to our skin and shine to hair. You should combine beans or sprouts with some cereals to enhance the protein quality. Of course eating them in the form of salad is the easiest. But when you are bored of it putting beans and sprouts in your salads, turn to this section and acquire the art of cooking them healthily in the form of subzis. Try your hands on recipes like Mixed Pulses with Vegetables a unique recipe with varied vegetables like cauliflower, baby onions and tomatoes. Spinach and Moath Beans Curry. However, don’t forget to try a few unusual subzis like Cucumber and Mixed Sprouts Subzi, using mixed sprouts ensures an abundant supply of protein and iron in the recipe, while combining them innovatively with chopped cucumber results in a well-balanced flavour and texture. Find interesting recipes like Sprouts Misal, Sprouted Masala Matki, Chana Soya Masala etc. in this section. You can even give a healthy twist to Usal a common Marathi dish usually made with oodles of oil, here we have used mixed sprouts and minimal amont of oil. 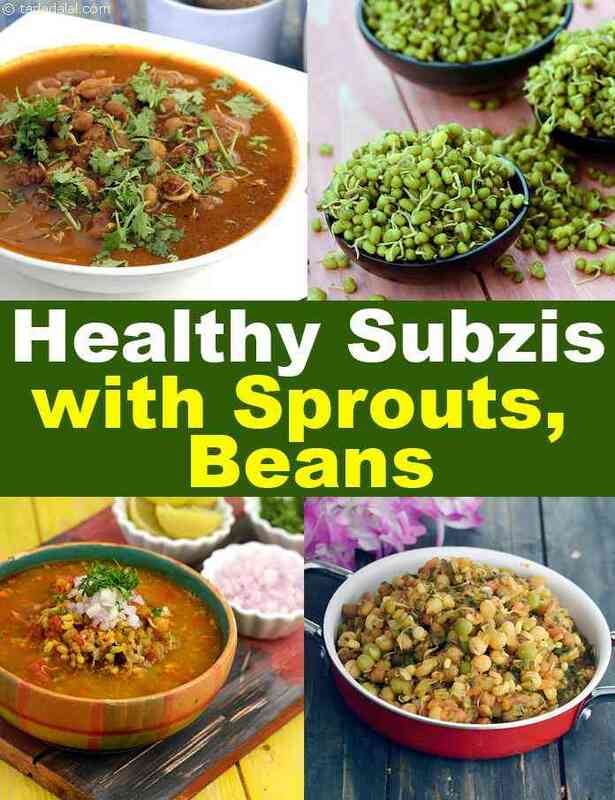 Enjoy our collection of Healthy Subzis with Sprouts & Beans recipes and Healthy Subzi articles below. A healthy twist to a common Marathi tale! Serve with steaming hot rice and oodles of ghee for an authentic Maharashtrian experience. You can use any sprouts of your choice instead of mixed sprouts. I bet you have never ever thought of sprouting Masoor! Try it today, and use it in this awe-inspiring Malwani gravy. Rajmah- a wonder bean is packed with nutrients like protein, zinc, fibre etc. Makes a nutritious, tasty and colourful combination with vitamin a rich palak. Wrap up this stir-fry in a chapatti to whip up healthy food for little fingers. Tomatoes stuffed with protein-rich sprouts and then baked, so as to make it healthy and rich in vitamins and minerals.